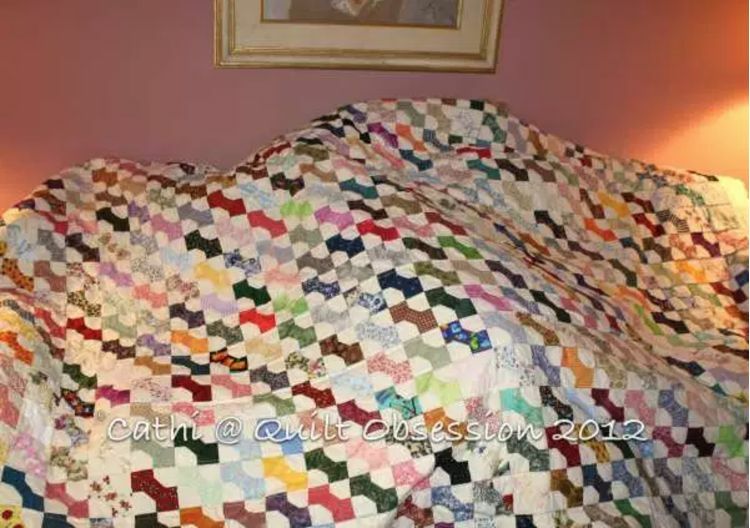 Are you looking for a simple quilt pattern, perhaps with a little whimsy? Then the 3-D bow-tie quilt block is for you! 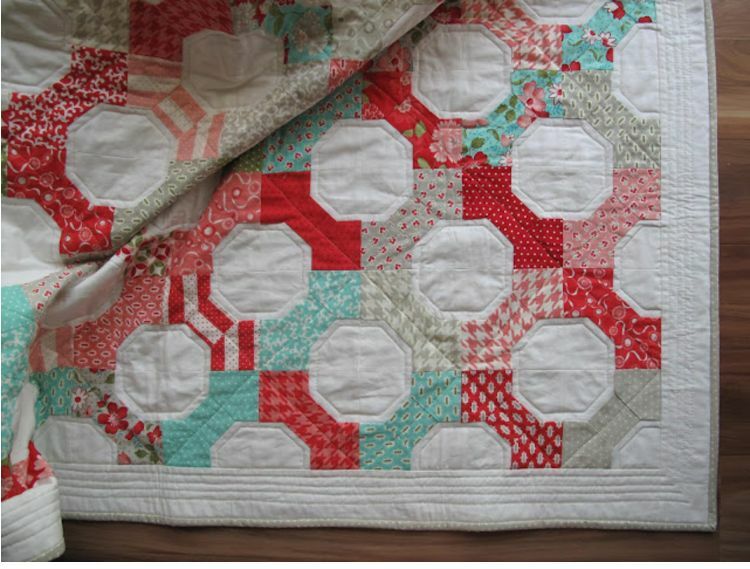 It is simple to make, and it looks adorable — perfect for using in a quilt for a little girl’s room. 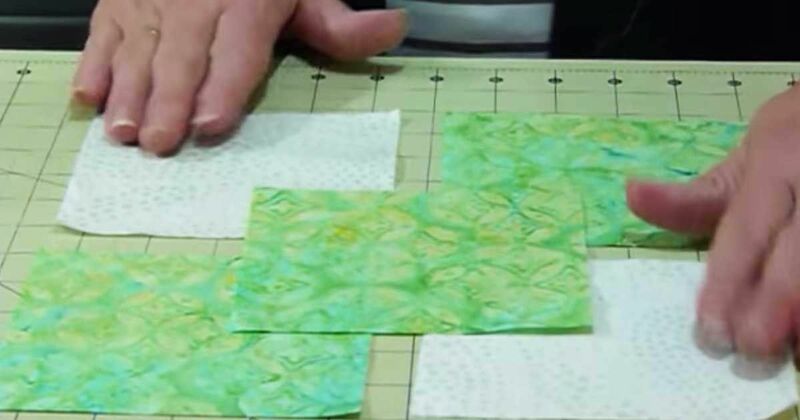 You can make squares of any size with this method, and you can even use your finished blocks to make a pillow instead of a quilt if you’d like. All it takes is five equal-size squares of fabric and a few minutes of sewing. It really can’t get much simpler (or cuter) than that! 1. Once you have your five equally sized squares, take one of the bow-tie colored squares and fold it in half, with the right side facing out, pinning it together. Julie Baird of Generations Quilt Patterns warns not to finger press the crease at this point because it will make it hard to press out the line later! This folded piece will become the knot of your bow. 2. Make a sort of “sandwich.” Take one of the background colored squares and put the folded square on top of it, with the pinned end up and the top edges aligned. Place a bow-tie colored square on top of that, face down, and be sure all the top edges are together. All the right sides should be facing each other. 3. Sew along the left side, always with a ¼-inch seam allowance. 4. Unfold the sandwich, as shown, folding the full squares of fabric outward so that your folded piece sticks out. 5. Place a background colored piece underneath the folded piece to begin a second sandwich. Place the remaining bow-tie color piece on top of it, just like you did before. 6. Stitch along the left side again, and then fold out the piece, as shown. It should look a bit like the letter H on its side. 7. Now it’s time for one last sandwich! Pin the edges of the rectangles you just made together, as in the picture above (making sure to have the colors on alternate sides). 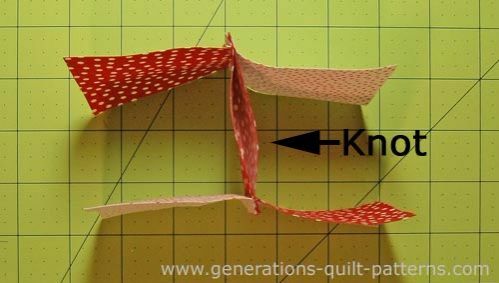 This turns the folded piece into a pocket. This is what will ultimately make your bow-tie knot 3-D.
8. Flatten the pocket as much as you can, and then sew the two rectangles together along the top open edge. 9. 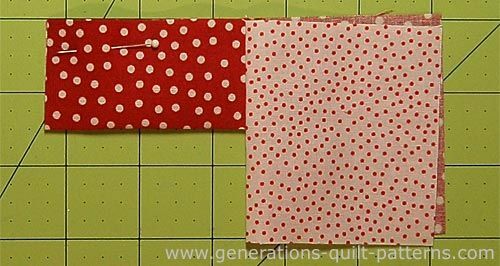 Open up the block, press the seams (be careful – pressing too hard with your iron can make your knot too flat! ), and you’re done! Once you’ve made your first bow-tie block, you can keep making more of them to fill up a full-sized quilt, or you can just make a couple of them to use as accent pieces. The choice is up to you, but whatever you choose, it will surely be adorable!